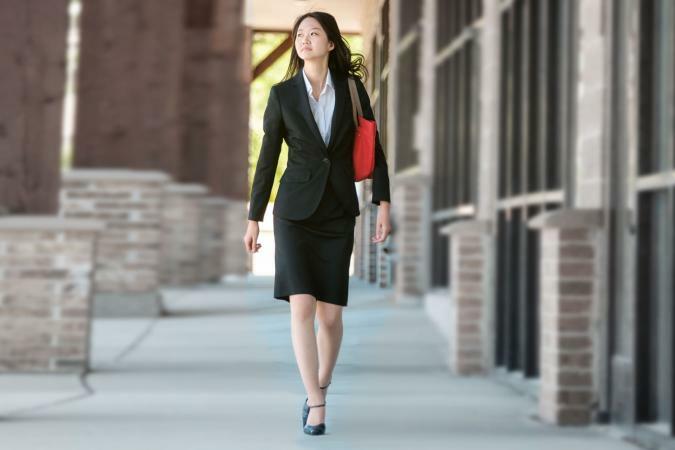 The tailored suit is a garment for women consisting of a jacket and a skirt, most often made of the same fabric. This name for the garment appeared in the fashion press around 1885. It owes its name to the particular manner in which it is made. Produced for women by tailors who specialized in the making of men's garments, it came to prominence at a time when the norm was to differentiate men's and women's clothing by means of very specific techniques, forms, fabrics, colors, and designs. The fashion spread almost everywhere in Europe and the United States thanks to the fame of the English company Redfern, whose style was made popular by famous women, notably Queen Victoria. The Parisian branch of the company, established on the rue de Rivoli at the end of the nineteenth century, contributed to this success. The emergence of this practical and functional garment within a previously uncomfortable and ostentatious female wardrobe shows the transformation in attitudes by Western society in the late nineteenth century. 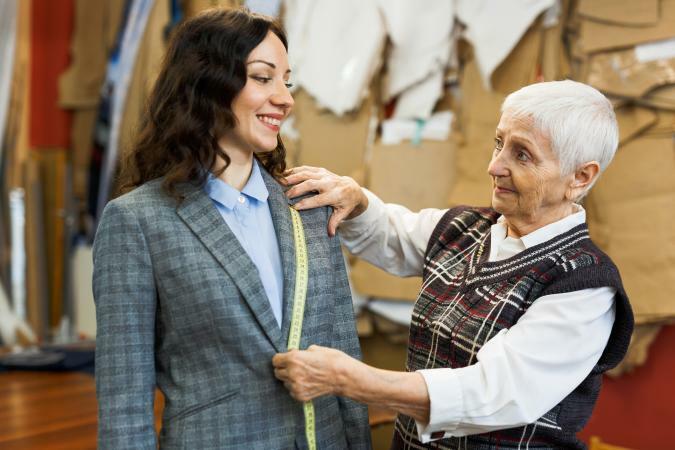 Women in search of new garments better adapted to ways of life connected to the industrial revolution and its resultant social transformations found the ideal garment in the tailored suit. Since the suit fit the requirements of such new forms of behavior as sport and travel, as well as the progress of hygiene, upper-class women played a role in its adoption by the general population. The affirmation of the suit by the urban middle class-primarily its emancipated women who took up professional careers-was the principal force behind its acceptance. The tailored suit had a veritable genealogy, however, and was not created ex nihilo. In particular, women's riding costumes became fashionable in aristocratic circles in the late seventeenth century. The costume of English Amazons, made up of a fitted coat and a short skirt, in favor in the late eighteenth century, was already close in style to what would become the tailored suit. Although dresses made up the bulk of women's wardrobes, jackets and skirts, often matched, had been worn since the late sixteenth century by the urban working class. This fashion spread in Enlightenment circles concerned with egalitarianism in clothing. Many details borrowed from men's clothing-buttons, pockets, colors, fabrics, and sometimes even pants-went along with the jackets and asserted equality between the sexes, suggesting the future of the tailored suit. Throughout the nineteenth century, jackets matched with skirts or pants were worn as a kind of manifesto for the emancipation of women, and the costume thereby acquired a nefarious reputation. A few major female representatives of nonconformism and radicalism, such as George Sand, Flora Tristan, Amelia Bloomer, and Emmeline Pankhurst, gave it an almost political character. Around 1850, the walking suit appealed to an urban society fascinated by nature and open space. This outfit made up of a jacket and a skirt that did not cover the ankles, in the age of crinolines and corsets, was the last avatar before the emergence and the success of the tailored suit. The first suits that can truly be given the name were marked by the English influence that predominated in the late nineteenth century. British women, who launched the craze for sports, travel, and tourism, were the first to adopt them. London society, where feminists were influential, adopted the style, which incidentally corresponded to the sobriety admired by countries with a Protestant culture. These first tailored suits had jackets whose cut and details were borrowed from men's clothing, but their forms were adjusted to match the curves of the corset. Skirts, particularly for traveling, were slit or made with wide pleats in order to facilitate walking. Suits were worn most often with accessories influenced by men's clothing, such as vests, shirts with wing collars, and men's hats. From 1890 to 1914, under the influence of sports, their form became more flexible: skirts flared, and less fitted jackets were freed from masculine criteria and standards. The swift adoption of the tailored suit led to its presentation in a variety of forms, with short or long jackets, for summer or winter, and for holidays or urban life. Sober and practical, its use was nonetheless coded. The garment was worn during the day for occasions on which no convention was required (shopping, walking, visiting). In the early twentieth century, the popularity of the tailored suit tended to make it the uniform of the middle classes. Young women employed in new professions, such as office workers and elementary schoolteachers, adopted it as a professional uniform. Solid and protective, like a coat, the tailored suit was mass produced, and its price thus made it accessible to a broad clientele. Department stores made it into a sale item. World War I accelerated changes. The tailored suit spread, becoming the war uniform of committed women wishing thereby to show their patriotism. The fashion press galvanized its use, thereby bringing together male and female wardrobes as well as blurring class distinctions. Couturiers expressed mistrust toward the tailored suit. The sober and comfortable appearance of the garment broke with the tradition of the ostentatious elegance of the Parisian houses. Similarly, the Anglo-Saxon influence was treated by the French fashion press with a certain contempt. The unquestionable superiority of London tailors in men's fashion was recognized, but there was firm opposition to any intrusion on their part into the universe of women's clothing. The first couturiers to introduce tailored suits in their collections in the early twentieth century were Jacques Doucet, Jeanne Paquin, and Paul Poiret, all creators who contributed to radical transformations in women's fashion. Jackets had a Directoire cut, a reminiscence of the eccentric elegance of the Incroyables. Coats, single-breasted and fitted, were high-waisted and usually made of fabric with broad stripes. However, when Paul Poiret launched the fashion for pencil skirts around 1911, after having liberated the torso from the corset, he imposed a new constraint, contrasting with the functional use of the suit. Under the influence of the younger generation, from 1910 to 1925, the tailored suit became one of the favored garments of Parisian couture. Jeanne Lanvin, Gabrielle Chanel, and Jean Patou were the most ardent advocates of the new garment. The style of the Parisian suit set the tone for the rest of the world throughout the twentieth century. Around 1910, the designs of Jeanne Lanvin blended the sporty informality of new men's fashion with youthful and refined elegance. The jacket was now worn open, revealing a simple blouse embellished with lace inserts, with a soft collar and no tie. Chanel, a beginner at the time, presented outfits made of soft jersey with an unfitted waist, large armholes, and short slit skirts facilitating walking. This very avant-garde version, which she had adopted from sports clothing, came together with the style imposed by the war in 1916. For her first advertisement, she chose three flowing suits with very short and flared skirts to show in Vogue. The sobriety of dress prescribed by the state of war became the rule in the 1920s. The modern democratic suit was worn night and day. The woolen suit, in masculine style, adopted the new straight and short line. The jersey outfit was extremely popular. Made of knitted wool, silk, or cotton, it was worn with a sweater taken from sporty and American fashions. The boldest of suits of the time was no doubt the pants suit. After a timid appearance around 1890 for riding bicycles, in the form of culottes or bloomers, in the 1920s it was worn as broad trousers with a navy blue jacket, exaggerating the masculine silhouette that was fashionable in the jazz age. Softer, made of silk or printed cotton, the beach pajama was an addition to the summer wardrobe. On the ski slopes, elegant women displayed, with a degree of insolence, outfits of jackets, tunics, and pants in mountain style, the most fashionable made by Hermès. The use of this androgynous outfit, however, remained confined to emancipated and eccentric circles, typical of California or French Riviera lifestyles. Outfits made of flowing silk, dressier, decorated with geometric or exotic designs in rainbow colors, provided a new and more feminine version of the suit. Similarly, the evening suit, lamé, embroidered, and glittering, indicated an unbounded love of partying after years of privation. Jean Patou was the most representative designer of the period; his style, influenced by American lifestyles, gave his suits, which had a masculine and sporty spirit, a singularity that appealed to garçonnes and was gradually more widely imitated. The strict, straight, almost geometric appearance of these suits achieved sophistication through the use of very refined accessories. The images of the American actress Louise Brooks wearing his suits in films and photographs perpetrate the influence of the modernist style of Jean Patou. By the 1930s, the tailored suit had definitively entered the wardrobe of Western women, on many occasions replacing the dress as the garment of the bourgeoisie. Its sober appearance was reassuring, and it attenuated social, cultural, and even national differences. However, the cost of the garment made it hardly accessible to the working classes. It became the symbol of a degree of success for the middle class, worn by women at work as well as those who stayed at home. Often very subtle details, in terms of the quality of fabric, of cut, or of accessories, revealed the economic and social status of the woman who was wearing it. Because of the economic crisis of 1929 and its political consequences in Europe, the rise of conservative and reactionary movements radically changed the image and the perception of the tailored suit. It lost its androgynous character for a newfound femininity. The use of sporty suits, notably those made of jersey in favor in the 1920s, was limited to leisure activities. Beginning in 1931, the woolen suit worn in town emphasized feminine curves: it outlined the breast, emphasized the waist, and flared in widened basques on the hips. Skirts were longer and adopted a narrower line, created by pleats, darts, and complicated cuts. Suits often had a severe and feminine line, exaggerated by the adoption of shoulder pads. This almost martial style experienced its apogee in the success it achieved in the authoritarian and totalitarian regimes of the period. Parisian couturiers, seized by the fad for neo-romanticism, decorated jackets in a manner increasingly distant from the original masculine cut, with lace, guipure, flowered-patterned linings, smocked shirtfronts, and jeweled buttons. The actress Marlene Dietrich stood out in contrast to this vogue, in which glamour and femininity went together, by appearing in films and in her life in men's suits made by the celebrated Austrian tailor Knize. In the 1930s and during the war, women in pants caused discomfort. The evening jacket, in a variant with a long dress, very fashionable in elegant circles, was the only exception to this general tendency. The suits made by Elsa Schiaparelli, influenced by the surrealist movement, with evening jackets richly embroidered with baroque and unexpected motifs, contributed notes of humor, derision, and refinement in a period that was conservative and conventional in taste. In the postwar period, the style of Dior did not challenge this orientation. The New Look suits, with very feminine lines, were the continuation of a form of attachment to the past. The stiff jacket with broad shoulders, a fitted waist, and oversized basques was worn over wide pleated skirts, recalling the silhouettes of the eighteenth century and the Second Empire. From 1955 to 1965, Parisian couturiers made the tailored suit their showpiece. They gave it a second wind by adapting it to the transformations of the consumer society. Balenciaga was the first couturier to dare to break with Dior's New Look. His single-breasted, full, and flowing jackets once again underemphasized the breasts and the waist, recalling the style of the 1920s. Similarly, Chanel suits, in tweed and colored woolens, were a modern version of the first styles that had made the house's name. In the early 1960s, the tailored suit became an absolute must, immortalized by Jacqueline Kennedy. Despite the boldness of mini-suits by Courrèges and the very colorful versions by Cardin, young women, in open rebellion, had little taste for the garment, preferring an explicitly rebellious wardrobe: leather jacket, mess jacket, cardigan, and work jacket, which they mixed and matched, rejecting anything that could in any way evoke a bourgeois uniform. For young women, the tailored suit embodied a fashion that resembled a yoke. Only the pants suit, whose ambiguous and androgynous character corresponded to the prevailing nonconformism, found favor in the eyes of young women who had made the liberation of mores a veritable battle cry. The denim or corduroy version was for those who wore it a symbol of political commitment. Yves Saint Laurent was able to echo this movement of rebellion in his collections: car coats, safari jackets, Mao jackets, and dinner jackets were modern versions of the tailored suit. The 1980s saw a revival of the fashion for the tailored suit, associating a certain taste for the classic with a representation of the consecration of women in the world of work. Armani's suits were hugely successful among executive women; those of Chanel enjoyed renewed favor as symbols of relaxed luxury and elegance; and suits by Thierry Mugler and Christian Lacroix were baroque and festive. This rebirth was only an apparent one because the tailored suit was gradually losing its raison d'être and being replaced by other garments. The uniform no longer appealed to women at a time when fashion was governed by the cult of youth; the jacket had become a free element, and it alone continued to develop. Pants suits, like those of Jean Paul Gaultier, can still express, in a society where clothing taboos have largely faded, a way for women to emphasize their difference and their particularity. See also Gabrielle (coco) Chanel; Jacques Doucet; Jeanne Paquin; Jean Patou; Tailoring. Breward, Christopher. Fashion. Oxford and New York: Oxford University Press, 2003. Steele, Valerie. 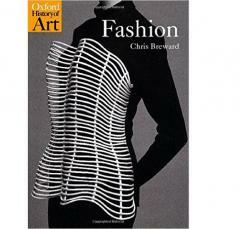 Fifty Years of Fashion: New Look to Now. New Haven, Conn.: Yale University Press, 2000. Waugh, Norah. The Cut of Women's Clothes 1600-1930. London: Faber, 1968.